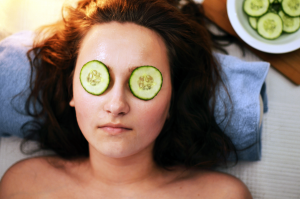 Express Facial ($40): A thirty minute facial treatment is a perfect way to get in a quick but yet effective cleanse and exfoliation. This facial consist of a double cleanse, Image Skincare customized masque, facial massage, anti-aging serums and moisturizers with SPF. Ultimate Facial ($75): A 55-60 minute treatment consisting of two hydrating and deep pore cleansers that are massaged onto the skin with the technicians hands and exfoliating brushes. Also during this customized facial, masques are applied to the skin to remove dead dull skin cells, increase cellular turnover and hydrate the skin. A full facial and shoulder massage are performed along with hand, scalp and congestion relieving massages. Ending this relaxing skin treatment are anti-aging serums and moisturizers suitable for your personal skin type with sun protection. This hour facial treatment is customized to treat your skin concerns from dry and sensitive, to wrinkles and sun damage, to oily and acne. Extractions and high frequency can also be performed during this facial to treat clogged pores. Back Facial ($80): Back facials are great for both men and women dealing with dry, dehydrated skin or acne on the back. Great for brides OR those heading to the beach for spring break or a long weekend at the lake! Rid your skin of back acne! O2 Lift ($85): The O2 facelift is a luxurious oxygen skin care treatment that infuses oxygen, plant-derived stem cells, peptides and a high concentration of enzymatic botanicals into the skin leaving it luminous, refreshed and rejuvenated. This oxygen skin care process provides a revolutionary treatment to exfoliate, illuminate and oxygenate. This treatment is GREAT FOR BRIDES! Indulge in this brightening oxygen lift a few days before your special day and look amazing in person and in photos! For best results, all facial treatments should be performed every 4-6 weeks.